All LEHI GATEWAY homes currently listed for sale in Lehi as of 04/20/2019 are shown below. You can change the search criteria at any time by pressing the 'Change Search' button below. "** Client is willing to provide this home fully furnished for asking price of $340,000 **Beautiful row-end town home with an amazing view! Seller had the home built with TONS of upgrades. 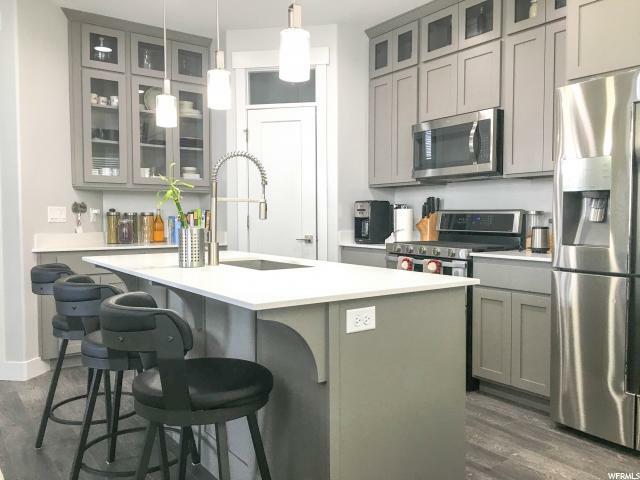 The home features 2-stage heating and cooling (zoned on all levels), 9-foot ceilings, gas cook top and double oven, full-height cabinets, back-lit upper cabinets, quartz counter tops throughout, and the ONLY unit in the complex with a cold storage room. The master suite in this home is fantastic - double sinks and all! Come check out this beautiful home in a wonderful neighborhood. Awesome location - close to schools, shopping, libraries, parks, and plenty of entertainment! Buyer may negotiate furnishings in home as part of the transaction on a separate bill of sale. *Square footage figures are provided as a courtesy estimate only and were obtained from an appraisal. Buyer is advised to obtain an independent measurement to verify all information. Call today for a quick showing!"